"For a dog in a shelter, being adopted is as awesome as being able to jump into a pool full of tennis balls." That's what Daniel Reitman, the owner of Dan's Dog Walking and Pet Sitting, believes. When Reitman was inspired by a Bay Area man's Instagram post about losing his dog, he wanted to make allegory a reality. In 2014, Chris Sontag-Ratti lost his best friend: a dog named Everything. As a way to honor her memory, Reitman said, Sontag-Ratti posted a flyer with a picture of Everything in January, which marked two years since she passed. "Please use this tennis ball to spend some time with your best friend. Thank you for helping keep her memory alive." Sontag-Ratti said that he would send one of the 100 tennis balls he bought to whoever wanted them. When he woke up the next day, he said, he had thousands of emails. In November, Sontag-Ratti was contacted by Reitman, of Long Island, with an opportunity to take his generostiy a step further. 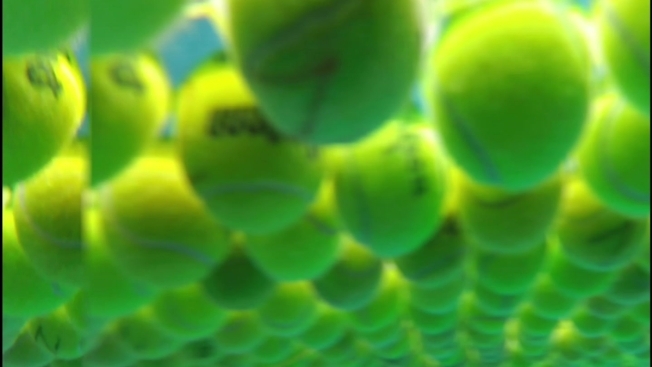 "He sent me a picture of (the thousands of) tennis balls he had," Sontag-Ratti said. "He told me was donating them to shelthers and that went with the theme of what I'm doing." Reitman explained to Sontag-Ratti that he began collecting up to 4,000 tennis balls since seeing the Instagram post. "We wanted to take his concept and apply it to getting dogs rescued from shelters," Rietman told NBC Connecticut. After getting Sontag-Ratti's photos and videos of Everything, Reitman and his team made their own video to bring attention to shelters and pet adoptions. When someone shares the Facebook posts and tags their favorite animal shelther, Dan's Dog Sitting promises to donate a bag of tennis balls to the named shelter. For more details on how you can help, check out their website.